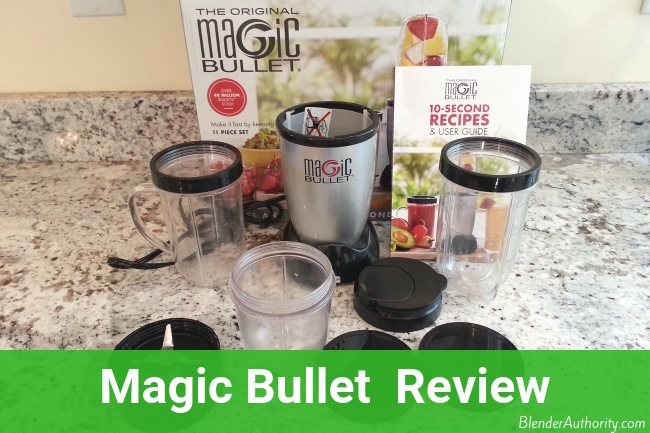 Magic Bullet Review - How did it perform in our tests ? The Magic Bullet blender has been very popular over the years but the big question is does it really work ? I know the infomercial makes this portable appliance look amazing but we did our own tests. In this Magic Bullet review we will discuss our results and answer all your questions to decide if this blender is right for you. Final Thoughts – Should you get one ? The Magic Bullet blender, which is made by the same company that makes Nutribullet blenders, was the first mainstream bullet blender to be widely sold through infomercials and sell millions of units. 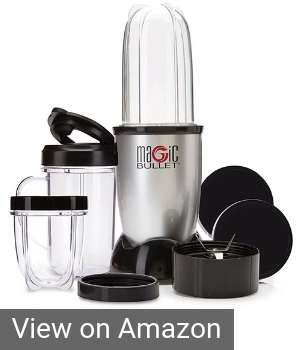 The Magic Bullet base uses a 250 watt motor for blending, dicing, and pureeing. It advertises that it can make smoothies, dips, sauces, dressings, food prep, and more. The assembled height including the Tall Cup is 12 inches with a 4.75 inch diameter. Blades: Depending on the Magic Bullet package you get, there are different Magic bullet blade types. The 3 blades are the 4-prong cross blade for blending and chopping, flat blade for milling and grinding, and ice shaver blade. The cross blade is the standard blade that comes with every unit. Jars: The maximum capacity is 18 ounces and it works with the 18 ounce tall cup, 18 ounce party mug, and 12 ounce short cups. Keep in mind that it is a single-serve blender and smaller than many other personal blenders. How to use the Magic Bullet blender ? 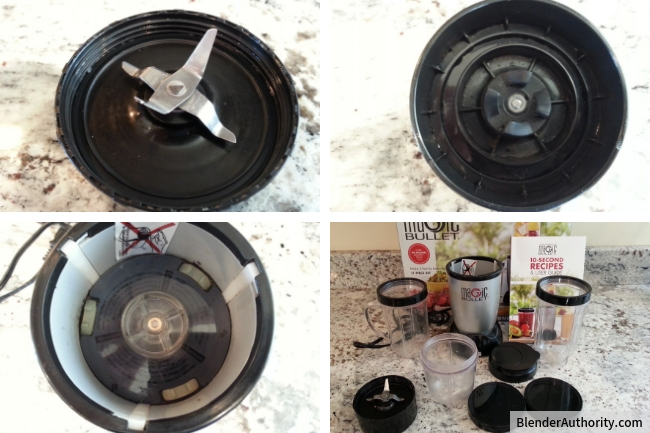 It works just like other bullet blenders where you screw the blade on to the blending jar, turn it upside down, and lock it into the motor base to start blending. The 17 piece Express Mixing Set is the same as the 11 piece set above but adds in a milling blade and more cups. The 250 watt motor is decent power for the size of the container but we found that the design of the blade does affect the blending results. We have reviewed a lot of personal blenders on this website including all of the Nutribullet models and found the Magic Bullet’s performance to be disappointing in many of our blending tests. It is useful for performing simple tasks like blending soft baby food, fruit smoothies, salad dressings, and making dips, but the quality of blending was lacking with green smoothies, chopping onions, milling oats, and grinding nuts. Also, the build quality of the Magic Bullet is lightweight and we were disappointed that our blade constantly leaked. Positives: It is low priced and there are 1000’s of customer reviews. It is lightweight, portable, and has enough blending power for simple blending tasks. Easy to follow recipe book. Negatives: We experienced leaking at the blade and it didn’t perform that great in our blending tests. The build quality didn’t feel as sturdy as the company’s Nutribullet blender line. The 18 ounce capacity is limiting for making smoothies. Overall Opinion: Our review of the Magic Bullet resulted in concerns with quality and performance. The blending results were disappointing especially in comparison to other small blenders. While it is affordably priced, we felt that the performance was too inconsistent and somewhat frustrating to use. Overall, the negatives surpassed the positives on this blender. The Magic Bullet only makes sense if you want a lightweight blender for simple ingredients and occasional use. We would rather pay a little more money for the Nutribullet 600 or 900 blender models which we love. Despite the many new Nutribullet blender models, two of the original models (600 and Pro 900) continue to be highest rated and top selling. In our Magic Bullet versus Nutribullet comparison we detail the difference between the two blender models. In summary, the Nutribullet outperformed the Magic Bullet in every blending test and we really don’t see a reason to get a Magic Bullet once you try the Nutribullet. There are a lot of Ninja blender models which we detail in our review of Ninja blenders. Among the Ninja models, the Nutri Ninja blender would be the closest competitor to the Magic Bullet. The Nutri Ninja has a similar blade design to the Magic Bullet but the Nutri Ninja offers 900 watts of blending power and a larger 24 ounce capacity. The Nutri Ninja offers better performance and durability compared to the Magic Bullet. Also, we have not experienced leaking with the Nutri Ninja like we have with the Magic Bullet. Related article – see our Nutribullet vs Ninja review if you are comparing those 2 blenders. The Ninja Fit is Ninja’s single serve blender with a powerful 700 watt motor and 16 ounce jar. The Ninja Fit is significantly more powerful than Magic Bullet’s 250 watt motor and can puree ingredients for smoothies and soups. The 16 ounce container of the Ninja Fit is pretty small and can be limited in fitting enough ingredients for blending. The Ninja Fit’s build quality is plastic and there are some complaints about durability especially for the price. Overall, the Ninja Fit will blend better than the Magic bullet but the Fit costs more. For the price, we prefer the Nutribullet product line for blending performance and features. The Baby Bullet is from the same company and is essentially a smaller Magic Bullet with a less-powerful 200 watt motor. As the name indicates, the Baby Bullet is packaged with accessories designed for making baby food. Side Note – Magic Bullet cups are not interchangeable with Baby Bullet cups. The blade design of the two blenders is the same and they offer similar blending performance. The build quality is the same between the two models and they are both designed for easy blending jobs with soft ingredients. The baby bullet is priced higher because of the specific accessories that come with it, which is fine if your main focus was on making baby food. If we had to choose between the two blenders we would just go with the cheaper Magic Bullet and use our own food storage containers. The Baby Bullet didn’t leak on us like the Magic Bullet did but it is limited as a blender to just blending soft foods. We prefer the Nutribullet 600 rather than the Magic Bullet or Baby Bullet. There is quite a range of food processors but a fair comparison would be the Magic Bullet vs a Mini food processor. We compared the popular Cuisinart Mini Prep food processor to the Magic bullet as both have 250 watt motors. The Magic Bullet cross blade works when you have enough liquid but we found is did poorly at chopping or dicing. Magic Bullet flat blade is a closer comparison to a food processor’s flat blade and it does alright for milling and grinding. The Cuisinart Mini Prep works much better with it’s proven blade design and wider 24 ounce container. If you plan to use the Magic Bullet for a lot of food processing then you probably won’t find is as useful as a mini food processor. The only advantage of the Magic Bullet is that is also can do blending which a mini blender can not. 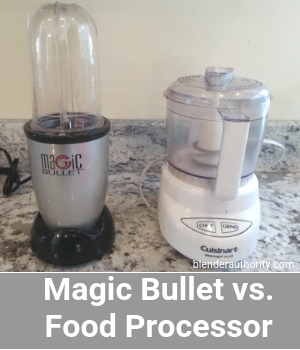 Is Magic Bullet BPA Free ? Yes, the cups are BPA free and says so in their manual. 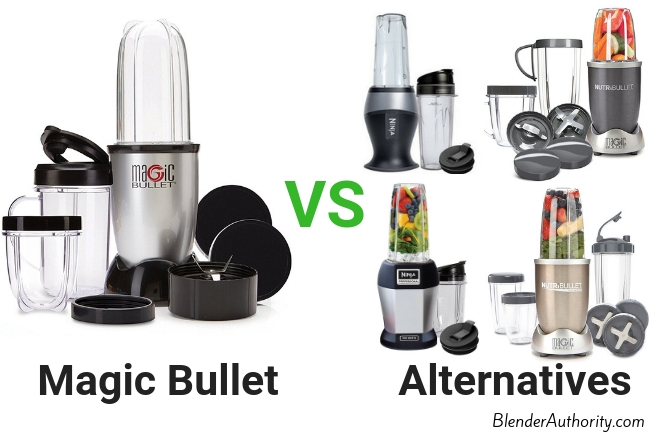 What is difference in Magic Bullet vs Magic Bullet Mini ? Magic Bullet Mini is smaller and very basic. What is difference in Magic Bullet blades ? The Magic Bullet comes with the 4 prong cross blade for blending and chopping and works like a standard blender blade. Extra blades are the Ice shaver blade for crushing ice and the flat blade for grinding hard nuts, spices, and beans. Where can I get Magic Bullet replacement parts ? I have seen replacement blade and replacement cups on Ebay and Amazon, BUT most of them are not authentic. Personally, I would only buy Magic Bullet replacement parts direct from the company for safety reasons. Here is a link to Nutribullet’s accessories website and just choose “Magic Bullet” in the filter by product box. What can you make with a Magic Bullet ? It can blend ice, fruits, soft vegetables, nuts, and seeds. It is used to make simple smoothies, baby food, dips, dressing, and small food prep. Here are some of the popular recipes that you can make including Magic Bullet salsa, hummus, dessert, and smoothies. How does the magic bullet work ? It works like a standard blender pulling the ingredients down into the blade creating a vortex so that you can puree. You can also pulse ingredients if you don’t want to puree. Are magic bullet cups dishwasher safe ? Yes on the top rack but DO NOT wash the blades. Overall, if you have read this far you will understand why I prefer other blenders. Magic Bullet’s inconsistent blending performance and weaker build quality prevent me from recommending this blender even though it is low priced. I feel the Nutribullet 600(see current price) or 900(see current price) are far superior for only a little bit more money. Another alternative if you are on a budget is one of the top-rated cheap blenders that we have reviewed.